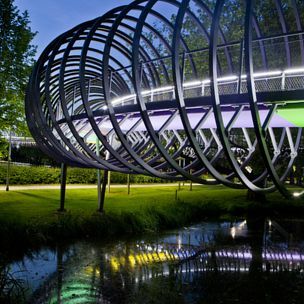 The bridge sculpture „Slinky Springs to Fame“, better known as the „Rehberger-Bridge “, was completed in summer 2011. 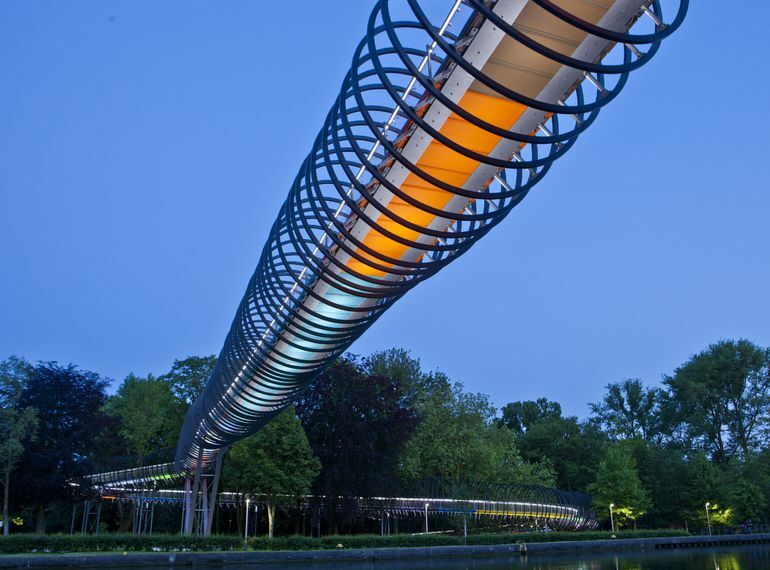 496 spiral-rings each with a five metre diameter encircle the 406 metre long construction which spans the Rhine-Herne-canal in Oberhausen. The bridge has two curved ramps and the main bridge. 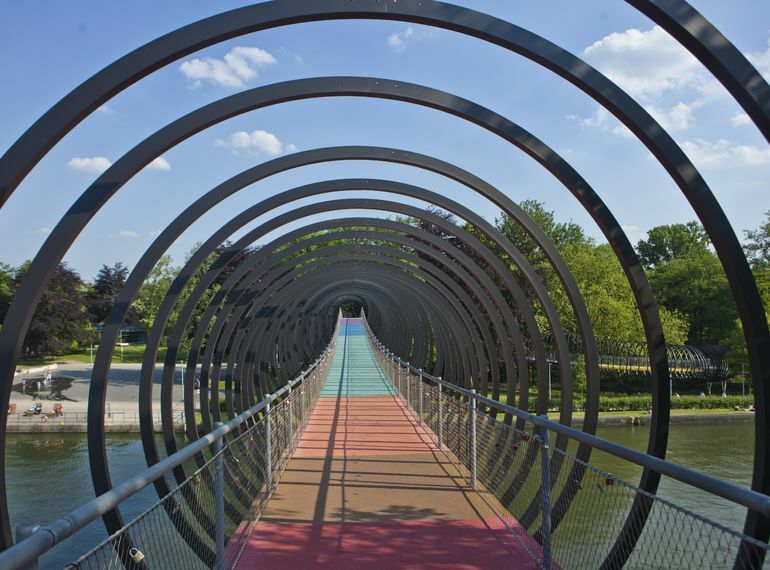 The ramps were cast on-site and the main bridge constructed as a stressed-ribbon bridge with pre-fabricated footpath elements. 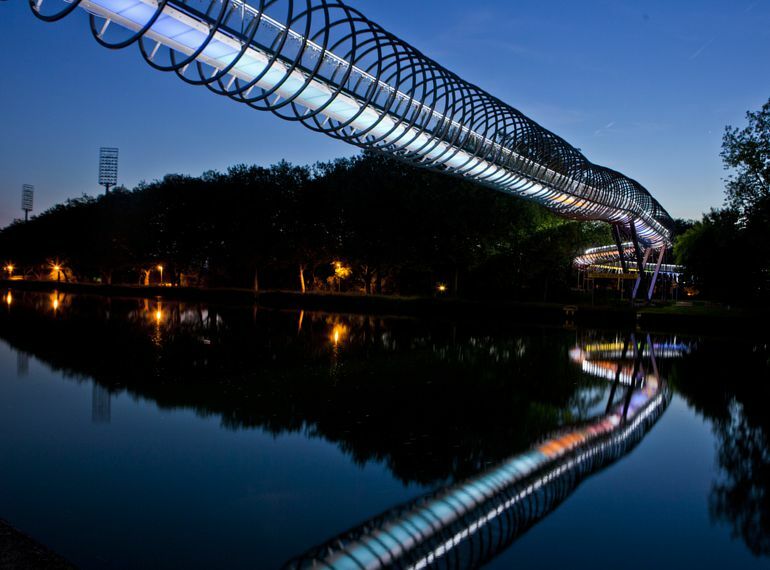 The bridge is suspended 10 metres above the water level to ensure safe passage for traffic on the canal below. 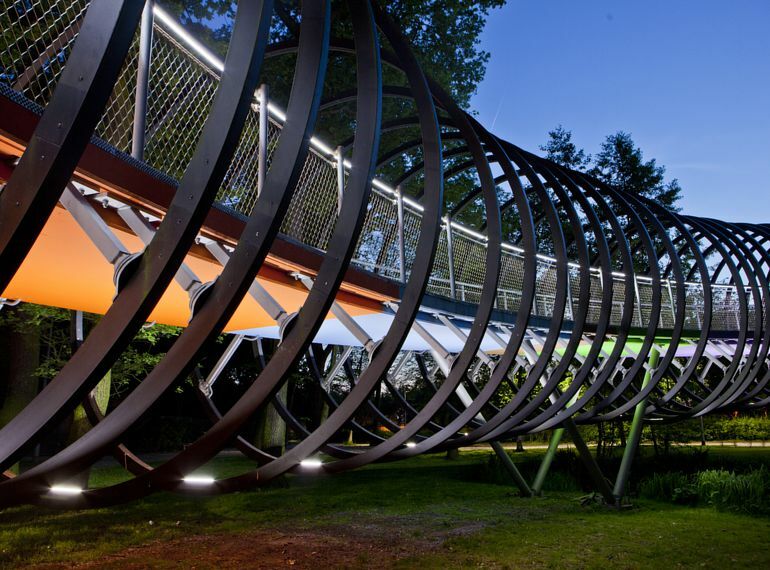 The sixteen, different-coloured, pre-fabricated slabs are bolted together and supported by two parallel metal ribbons to create a two and a half metre wide footpath. 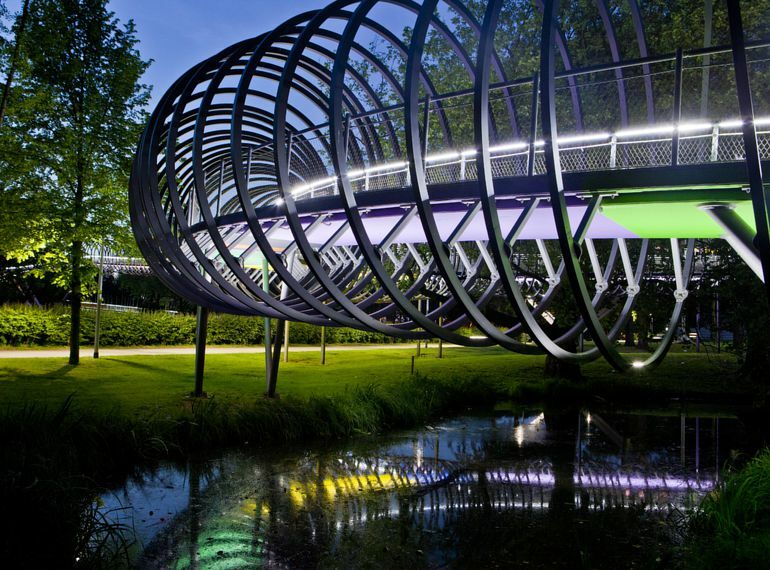 are illuminated and give the „Schloss Oberhausen“ park a special atmosphere. 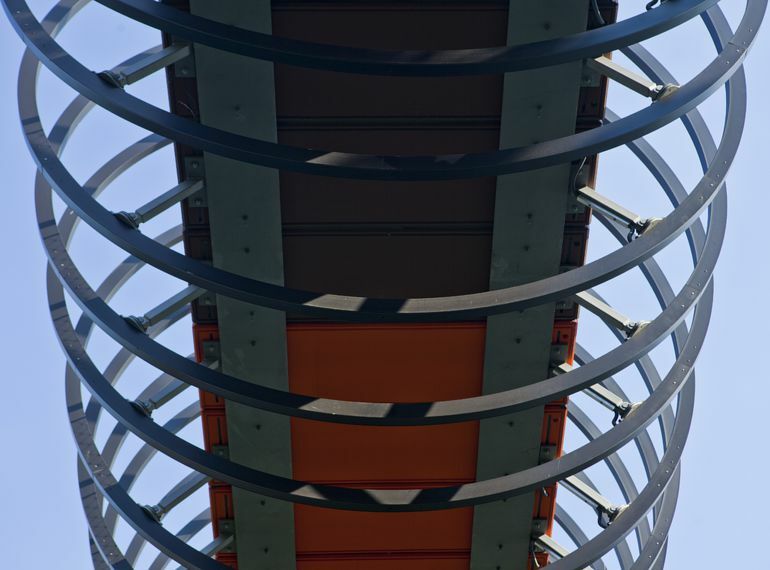 HALFEN developed a special element consisting of two serrated channels, a HZM 53/34 for the guardrail and a HZM 53/34 or a 38/23 as necessary, to connect the spiral under the pathway. The channel profiles were welded together with rebar. The rebar provides anchorage and simultaneously served as a spacer. This method made it possible to connect the guardrail to the top of the slab and the spiral underneath the slab using the same element. The 15 cm thick concrete slabs in the ramp and the12 cm thick concrete slabs in the stressed-ribbon bridge presented a challenge as the available remaining anchorage depth was minimal. Nevertheless, HALFEN engineers were able to verify the statics using the then newly approved, calculation method for anchor channels according to CEN/TS 1992-4. This allowed the spiral and the guardrail to be connected, safely and quickly, to the concrete on-site slabs as well as to the concrete precast slabs.